Asperger is a syndrome, also known as Asperger’s disorder, which is a particular type of pervasive developmental disorder (PDD). PDDs are a collection of conditions that involve the delayed development of many different fundamental skills. These can include the ability to socialize, communicate or use the imagination. There’s a spectrum of-of how severe the impact can be within the PDD disorders. Asperger’s syndrome was named after the Austrian-born doctor, Hans Asperger, who first identified the disorder in 1944. However, Asperger’s syndrome was not acknowledged as a unique disorder until much later. Challenges with Socializing Skills: Children with Asperger’s syndrome often have difficulty interacting with others and often feel very awkward in social situations. They typically do not make friends quickly; They also have difficulty initiating and maintaining conversations. Unconventional and Repeated Behavior: Children with this disorder may develop unusual, repetitious movements, such as finger twisting and-and hand wringing. Difficulty Communicating – Individuals with Asperger’s syndrome may not make eye contact when speaking to someone. They may have trouble understanding body language or trouble using facial gestures or expressions. They also have difficulty understanding language within the context daily use, as everything is very literal in their use of language. Limited range of interest – Children with Asperger’s syndrome may become very intense and even obsessive about a few things that interest them, such as maps, weather, sports schedules. Body coordination challenge: Their movement may seem clumsy or awkward. Skilled or talented- They may be exceptional talent or skill in a particular area, such as music, math or science. There are no known causes for Asperger’s syndrome, However it does run in the family, which suggest that it may be an inherited genetically, passed from parent to child. Asperger’s syndrome has recently been recognized as a different disorder, So the exact number of people with this disorder is not known yet. It is more common than autism, which is estimated to affect 1 in every 250 children to 1 in every 10,000 in the United States and Canada. It is also for times more likely to be diagnosed in males than in females. It is regularly diagnosed in children between the ages of two and six when their communication and language skills are developing. If there are symptoms in a child, a doctor will begin with an evaluation, by performing a complete medical history overview, and pushayical and neurological exam. 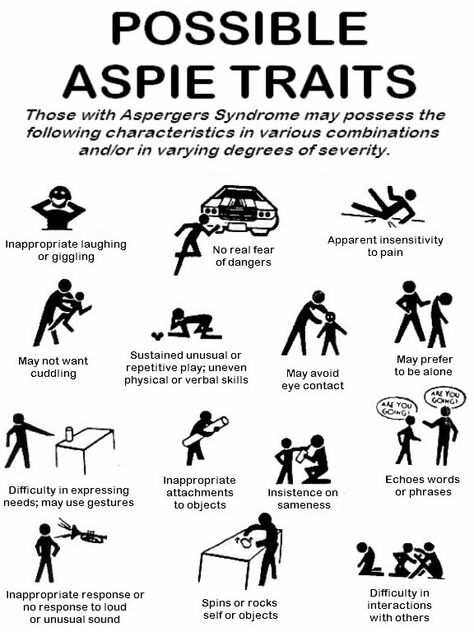 Many people who have Asperger’s also have low muscle tone and dyspraxia or coordination. Although there are not test that si specifically for Asperger’s syndrome, the doctor will use various test, such as X-rays’and blood test to determine if it is something else, such as a physical disorder causing these symptoms. Special Education: Education that is specialized to address the child’s unique learning and educational needs. Behavior modification: This includes approaches for encouraging positive behavior and to discouraging problematic behaviors. Speech, physical and occupational therapy, These are therapies that are developed to increase the child’s functional abilities. Social Skill therapy: These are therapies that help build social skills and contribute to improving the capacity to recognize verbally and non-verbal cues. These are often run by psychologist, counselors, speech pathologists and social workers. Medication There are no medications that treat Asperger’s syndrome itself. There are drugs that will treat specific symptoms, such s anxiety, hyperactivity, obsessive-compulsive behavior, and depression. What is the outlook for Individuals with Asperger’s Syndrome? Children with Aspergers syndrome develop the risk for other conditions such s ASHD, schizophrenia, obsessive-compulsive behavior, and depression. Fortunately, there are several different behavioral therapy, medications, and consoling options available for these conditions. Since people with Asperger’s syndrome, have normal to high levels of intelligence, they are able to function very well. However, they may still continue to have problems socializing with others, into adulthood. Can Asperger’s Syndrome be Prevented? Asperger’s Syndrome can not be cured or prevented, Although with early diagnosis and treatment, quality of life and the ability to function can be improved.